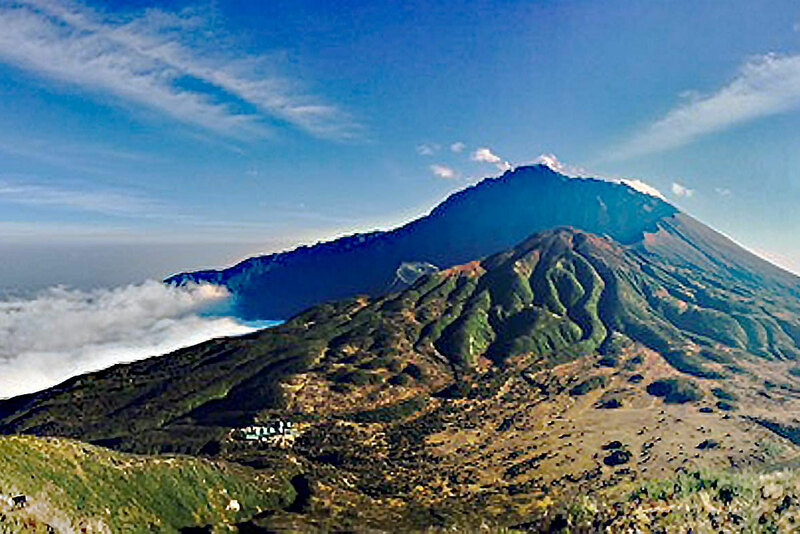 Mount Meru is the third-highest mountain in Tanzania at 4566 meters, only the Kibo and the Mawenzi (the highest peaks of the Kilimanjaro massif) rise further into the sky. The mountain was formed by volcanic activity in the East African Rift Valley. About 250,000 years ago, the entire eastern flank of the volcano was blown away by a violent outburst, an impressive sight to this day. The mountain is located in the middle of Arusha National Park, so the hike on the first day has a special charm. In the lowlands of the mountain, accompanied by a ranger, you will see baboons, buffaloes, giraffes and other wildlife. The ascent leads through various vegetation zones, from the grassland into the rainforest, and through the heath and moorland into the alpine desert. A great mountain, which stands unjustifiably in the shadow of Kilimanjaro. The Meru is technically more difficult than Kilimanjaro and requires a good condition - the last 1000 meters are quite steep. However, climbing skills are not required. The mountain is also used by many to acclimatize for the Kilimanjaro ascent - this combination is also possible with us on request. The Mount Meru climb is recommended by us as a 4 day tour. For experienced and very fit mountain hikers with high altitude experience, the tour is also suitable in 3 days. The third day of the shortened tour walks after the summit directly to the Momella Gate. Overnight stays are in simple wooden huts. 1.5 - 2 hours you will reach the Miriakamba Hut. Here you spend your first night on Meru. hours you will reach the viewpoint of Mngongo wa Tembo (Elephant Ridge), which is at a height of about 3200 meters. The ascent takes place partly over wooden steps, since the path is steep and slippery in some places. From this vantage point, you will have a magnificent view of the large, burst crater. After a short rest, the trek continues to the Saddle Hut. Just before you reach it, the landscape changes from mountain rainforest to light bushland. After lunch, you will have the opportunity to take a detour to the summit of Little Mount Meru (3820m), this 1-1.5 hour hike will reward you with a great view over the national park up to Kilimanjaro. Back to the hut it is time for your dinner, after that it is straight to bed. Tomorrow is the summit day and it starts early! you will continue to Mirikamba Hut, reaching it in the early afternoon. Here you can rest and enjoy your summit success. Note: Although the summit stage has some easy climbing passages, these are not secured. Surefootedness and a good head for heights are required. In bad weather conditions (heavy rain, dense fog, icing of the rocks) the accompanying ranger may choose to abort the ascent. An ascent during the great rainy season (April / May) is not recommended. Single accommodation is not possible on this tour, as the overnight stays take place in mountain huts with multiple occupancy.